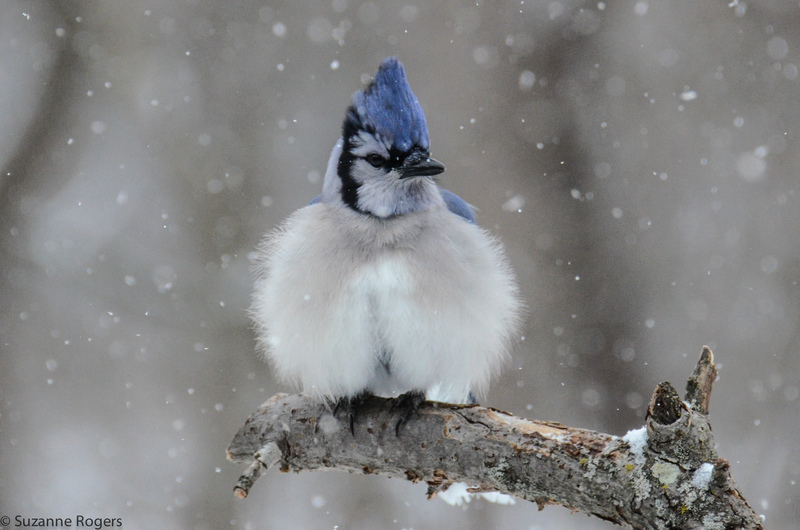 These Blue Jays are keeping their feet tucked under their bodies to stay warm…I hardly ever see this..but it’s getting to be a regular occurrence. Our windchill factor has been down as low as 35 degrees below zero and birds are still showing up for birdseed…I hope that they are able to outlast this series of Arctic Blasts. The words above are the words the blue jay is singing as he begins his approach to get a snack. Seeing the other bird, he “threw it into reverse”..And I imagine he probably stopped singing and I imagine he said “WHOA”!!!!!!!!!!!!!!!!!!!!!!!!!! How did he not notice the big woodpecker dining right in front of him?